The enigmatic heroine Vanessa Ives, as portrayed by actress Eva Green in the Showtime drama Penny Dreadful, comes to 3-D life in this exciting Vanessa Ives 8-Inch Action Figure from Bif Bang Pow!. In her patterned satin dress and overcoat, she's the must-have character for your collection, but you'll want every one of these first-ever retro action figures based on the show! Other action figures sold separately. San Diego Comic-Con runs from July 24-27, 2014. 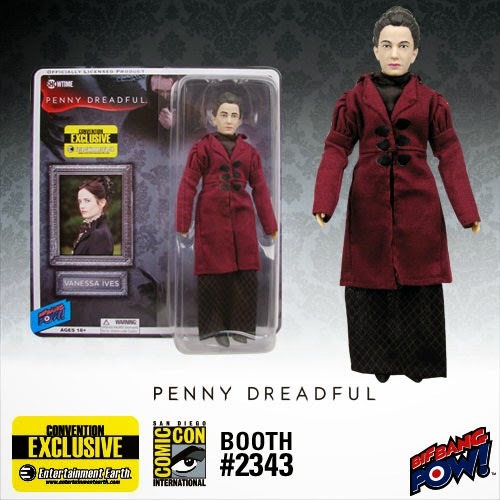 Come see us at booth 2343 to pick up all of our Penny Dreadful exclusives!